Continued high birthrates and four decades of plummeting death rates have swelled the population of the Caribbean Basin at record rates, building-in momentum for future growth. Between 1940 and 1980, Mexico and other Caribbean nations grew by an annual average of nearly 3 percent, doubling in population every 21 years. Mexico's population will reach 109 million by the end of the century, and 155 million by 2025. By 2000 the population of Caribbean Basin states, 250 million, will approach that projected for the U.S., 266 million. This dynamic growth, and the rising numbers of youth have momentous implications for the region's stability, economic health, employment and urban quality of life. No less momentous are the demographic, security and immigration consequences for the U.S. itself. Immigration to the U.S. has climbed sharply since the 1960s, as the numbers of restless, mobile youth have grown, with annual permanent legal and illegal immigration now estimated at 500,000 to 600,000. Demographic trends and poor economic prospects point to even higher migration pressures. For the next three decades young job seekers will crowd into the labor market faster than the region's developing economies can absorb them. Mexico, which stressed capital-intensive development in gaining economic growth rates well over 6 percent in the 1960s and 1970s, created jobs for less than two-thirds of new entrants into its labor force. 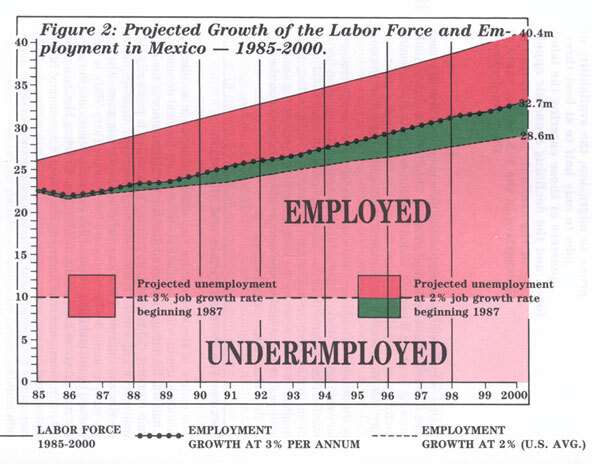 Now beset by shrinking oil income and heavy debt, and with half its labor force lacking satisfactory employment, Mexico must create 900,000 new jobs a year in the remainder of the 1980s and 1 million a year in the 1990s just to hold the line on unemployment and underemployment. Mexico must create jobs at almost half the pace of the U.S., but with an economy one-twentieth its size. Continued political stagnation, increased repression, or internal strife could send hundreds of thousands of additional Mexicans northward in search of safety or economic relief. Poor world economic conditions and conflict have stunted economic growth in Central America. With a combined economy the size of West Virginia's and half their labor forces unemployed or underemployed, Central America's five states must create over 300,000 jobs a year just to hold their own. Rapid urbanization, pressures on the land, and severe income inequities reinforce already high migration pressures in the region, particularly in El Salvador, and increasingly in Guatemala and Nicaragua. While their population growth is slowing, major Caribbean island immigrant sending states also face rising demand for jobs with stagnant economies. Deeply rooted ethnic, kinship and cultural ties in the U.S. continue to lure young Caribbean islanders to the U.S. metropole in good times and bad. Mexico and other Caribbean nations must together create jobs for nearly 1.8 million new entrants each year to their labor forces, plus an additional 500,000 to 600,000 jobs a year if they are to reduce their existing unemployment and underemployment to the levels of most western countries by the year 2000. Unpromising world market conditions and the absence of the massive investments needed put these targets out of reach. Even with annual job growth of 3 percent -- a commendable rate by U.S. standards, Mexico would reach the year 2000 with 7.7 million unemployed, 19 percent of its labor force, and some 9 million still underemployed. The quality of new jobs will also shape migration choices. Low wage jobs in labor intensive industries may be insufficient to hold many restless young people who see richer returns in the U.S. This burgeoning pool of prospective migrants demands enlightened long-term and prudent short-term responses by the U.S., such as easing debt burdens mobilizing job-producing investments, and further opening the U.S. to the region's exports. More family planning assistance would lighten future pressures. But none of these measures will significantly alter intense migration pressures for the rest of this century. While seeking enlightened long-term solutions, the U.S. must also take prompt prudent measures to strengthen its border controls and to limit access to its job market and social welfare entitlements to its citizens and legally resident aliens. Few nations have had faster population growth than Mexico and other Caribbean basin states. According to the Population Reference Bureau (PRB), the average annual rate of growth in tropical South America is 2.4 percent; 2.7 percent in Central America; and 2.5 percent in Mexico. Behind these seemingly innocuous percentages lies a powerful population dynamic. A visitor to Mexico on the eve of the Koran War in 1950 would have found a languid and uncrowded country of 27 million, a little over 3 million of them in the capital city. If our visitor returned in 1985, just half a lifetime later, he would have found a teeming nation of 80 million, with three Mexicans for every one that existed in 1950. The demographic explosiveness of those 35 years would be most evident in Mexico City: it has swelled 6 times over its 1950 size to a bloated, troubled and sprawling mega-metropolis of 18 million, the world's largest city. Other nations of the region and their cities, though smaller in scale, would display the effects of growth rates no less vigorous. The returning visitor would also be struck by the number of young people. While he was aging, the population of Mexico and other Caribbean basin states was steadily becoming more youthful. He would find nearly half the population less than 15 years old and almost two-thirds under 25. Surging growth and growing youthfulness of the population have fed the region's soaring immigration to the U.S. in recent decades. In 1985, a representative year, 35 percent (or almost 200,000) of all legal immigrants to the United States and 97 percent of all illegal immigrants apprehended came from the Caribbean basin. Given the projected rise in population, the prospects are for even greater immigration pressures. This study examines the astounding growth of the region bordering on the Caribbean (including El Salvador), its causes, and its potential for even greater increases, and the problems in portends for those nations and for the U.S. In 1980 the population of the countries of the Caribbean Basin, Mexico, Central America, the island states, and the nations of Colombia, Venezuela and Guyana, totaled 166 million. Just 30 years before, less than 70 million lived in the region. In those 3 decades, the population more than doubled, adding more than 96 million. Between 1980 and 2010, another 30 year period, the population will double again, about 320 million. Approximately 154 million more inhabitants will be added in three decades even though fertility rates should fall considerably. By the year 2025, the Caribbean region's population of 366 million will dwarf the 295 million foreseen for the U.S. Thus, the vigorous growth we see now is little more than the tip of the demographic iceberg. To understand the area's truly remarkable past and prospective growth, we must look at two crucial demographic phenomena: exponential growth and population momentum. Human populations grow exponentially. At an annual growth rate of one percent, a population doubles in just under 70 years. As an example, Central America's current growth rate of 2.7 percent, if maintained, will double its 26 million population in about 25 years. Although the time period needed for the population to double remains constant, the number itself being added in each time period doubles. Central America's projected population of 52 million in 2011 will double once again by 2036 to 104 million. But in the later doubling period 52 million will have been added compared to only 26 million in the earlier period. But populations do not exhibit constant rates of growth over long periods. A region like Central America could not maintain such a rate for many years. Fertility would fall, mortality would rise and/or massive emigration would take place. In any event, the result would be a lower growth rate. Momentum is equally important to understanding population change. There is a built in momentum for growth in any young population. Populations grow or shrink as a result of differences between births and deaths (natural increase) and between immigration and emigration (net migration). The main source of momentum is fertility. The number of births in any given year depends not only on the birth rate but on the number of women of childbearing age at that time. Many women averaging two births can yield higher total births than fewer women having many children. The U.S. population exemplifies momentum. While American women have averaged only 1.8 live births during the past 15 years, a number not sufficient to replace the population in the long run, births still outnumber deaths. The number of births has increased in recent years (though the rate has remained constant) simply because there are so many women of childbearing age, the legacy of the baby boom of the 1950s and early 1960s. Many Latin American countries will follow a similar pattern. Changing patterns of fertility, as well as mortality, alter the age distribution of a population. Countries with high fertility have larger proportions of youth. Whenever mortality begins to fall in developing countries the proportion of youth rises, as the decline occurs primarily among infants and young children. Children who might have died when mortality was higher are more likely to reach adulthood Most countries in the Caribbean Basin have young populations. 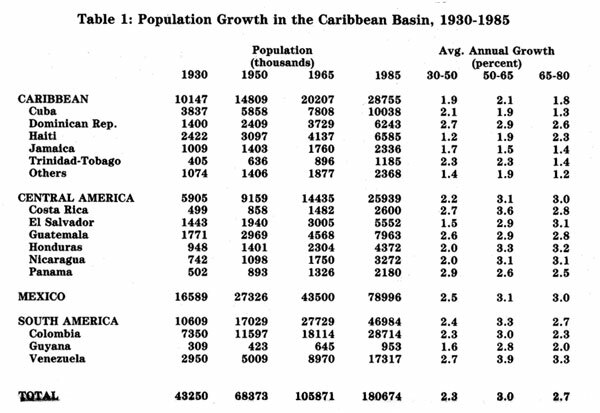 Four Decades of Record Population Growth: The "Death Dearth"
Between 1940 and 1980 the population of the Caribbean Basin had tripled, from 55 million to 166 million. Such growth over an extended period was the highest ever recorded in the Americas and possibly the highest ever recorded on planet Earth. With annual growth averaging nearly 3 percent for the 40-year period, the population was doubling every 21 years. Some countries grew more rapidly than others. Rates were extremely high in Mexico, but lower in the islands. By 1980 Mexico had over 42 percent of the Caribbean Basin's population, compared to 36 percent in 1940. In contrast, the proportion living in the islands fell from 25 to 18.5 percent. Changing mortality rates explain the region's remarkable growth in four decades. Except for the islands, international migration was not a major factor. The birth rate did not go up, but fell slightly in most countries in the region. The significant decline in mortality, mainly among infants and young children, a "death dearth", was clearly the prime factor. On the eve of the Mexican Revolution in 1910 a working class Mexican mother of six children faced the probability that two of them would die in infancy. By 1970, because of great strides in public health and education beginning in the 1930s, infant mortality had been reduced five-fold. The Mexican mother of six had a much better than even chance that all of her children would reach adulthood. 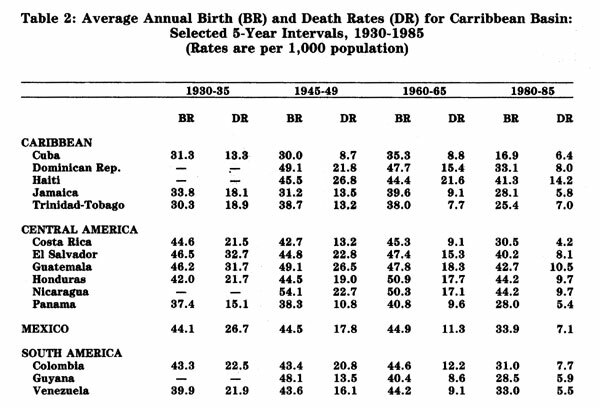 Tenuous earlier demographic data show that birth rates in the mainland countries of the Caribbean Basin were very high in 1940, perhaps 45 to 50 per 1,000 population. Significant declines in fertility began during the 1970s. By 1980 the average number of live births per woman had fallen from between 6 and 7 in the 1940s to between 4 and 5 in most countries in the region. While markedly lower, these rates are still more than twice the U.S. average. Progress in extending life expectancy was remarkable even before 1940. By 1980 death rates in most of the region were well under 10 per 1,000, about half their 1940's average, and life expectancy at birth surpassed 60 years. There were exceptions: Haiti, in particular, still had a life expectancy of only 52 years. With birth rates still high and death rates tumbling rapidly, growth rates spiraled, from a regional average of about 2.5 percent per year in 1940, to 3.2 percent in 1960. Only in 1980 was there evidence of a slight drop to just under 3 percent. Changing fertility and mortality sparked a "youth explosion." In Mexico and Central America the proportion of youth under age 15 spurted from about 40 percent in 1940 to 44 percent in 1980. With such young populations, the momentum for further growth is "built-in." In demography too the past is prologue. The region's "death dearth" has set the conditions for a predictable increase in momentum for future growth. Mexico demonstrates this kind of momentum in the extreme. Thanks to previous demographic behavior, 63 percent of all Mexicans today are under age 25. As this large generation moves into its reproductive years, it carries considerable potential for even further growth regardless of future birth rates. A brief look at selected age groups in Mexico over recent decades illustrates momentum at work. Children under 15 have increased three-fold since 1950 to 33.3 million in 1985. The number of young adults (15-24) has similarly tripled to 16.6 million. The number of women of reproductive ages (15-49) has risen from 6.3 to 18.7 million. Dramatic increases in the proportion of children and young adults, then, are the first shock waves of a population explosion that began some two decades earlier. Their impact will be felt for years to come. Even with sharply reduced fertility, the number of Mexican births will increase in future years simply because the number of women of reproductive age will be larger. As a result, Mexico's population of about 80 million in 1985 will reach 109 million at the turn of the 21st century and surpass 154 million by 2025, at which time the annual rate of growth will be slightly more than 1.0 percent. In Central America the population will increase from 26 million in 1985 to 68.2 million in just 40 years. Growth will be somewhat slower in the South American countries in the region and much slower in the Caribbean. Figure 1 illustrates the rise of Latin America's population despite falling fertility in upcoming years. Looking ahead, the Population Reference Bureau (PRB) sees continued growth in the Caribbean Basin in the next 35 years, even though fertility has been falling and is projected to keep falling. In Middle America, for example, the population grew by 68 million in the last 35 years; but it will grow by 104 million in the next 35.1 At the same time, fertility will continue falling. By 2025 the region's average number of live births per woman is assumed to be between 2.2 and 2.6. The seeming paradox of falling fertility/rising population illustrates the built-in momentum for growth in any young population. Even if fertility were reduced overnight to replacement level (about 2.2 live births per woman), population growth would continue for many years. The region's many children under age 15 will soon reach the age of parenthood. Even if they limit themselves to 2 children on average, the number of births will still be quite large. Not until the following generation will the lower fertility trend show up as a declining number of potential parents. Only then will the number of births subside, providing that average fertility per woman remains low. Eventually, deaths will equal births, but by then the population will have doubled, demonstrating the population momentum underlying the visible "tip of the demographic iceberg," the far greater mass of which is still to surface. The large number of children born before fertility declined in the late 1960s and early 1970s is just now entering adulthood. The critical 15 to 24 age group will grow alarmingly, particularly for the next 20 years. Of that we can be certain because they are already born. 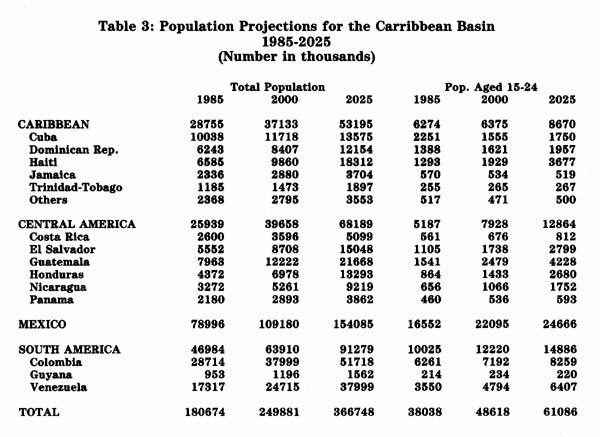 In 1985 there were 38 million people between 15 and 24 in the Caribbean Basin; 15 million will be added in the next two decades and by 2025 they will number about 61 million. Clearly, momentous demographic changes have taken place in the region since the mid-20th century. Infant and child mortality has fallen precipitously. Fertility, while still high, has dropped somewhat in recent years. With such limited success in reducing family size, population growth remains a major concern in most countries in the area. The effects of the population explosion of the 1960s and 1970s are only now beginning to be clearly seen in the massive proportions of young adults and children, a trend that raises disturbing questions about its long-term consequences. What impact will population growth and changing age composition have on the social and economic order of the Caribbean basin nations in the 21st century? Can the region support a population of 250 million just 14 years from now, much less than the 366 million in 2025? These numbers assume substantial fertility declines. Will birth rates fall as rapidly as assumed in these projections? Can the region's political and social systems bear up under the weight of such numbers? Will emigration take on increased importance? And if so, in what direction? The hefty absolute numbers, and their skewed age structure, foreshadow a worsening of the area's already serious problems of unemployment, housing, land availability and, of particular concern to the U.S., the emigration of those who see no prospects in their native land. The current age structure will largely determine the size of the region's future labor force. Relatively high, though falling, birth rates and increasing life expectancy mean that the total population will grow at about 2.5 percent per year. But the labor force will increase at about 3.3 percent, at least until the year 2000. This annual difference translates into large differences in absolute numbers. Since most of those who will make up the region's labor force in the year 2000 are already born, we can project the number of new jobs that will have to be created between now and then simply to maintain the current already unacceptably high rates of unemployment and underemployment. Table 3 depicts the rapid growth of the region's working age population that will nourish the labor force. This study discusses later on why the region's economies will be hard pressed to create enough new jobs, even if they grow at high rates. The flight to the region's cities will continue, the consequence of rural stagnation, pressure on the land, and the lure of city amenities. The demand for housing will increase apace. The rapid influx has harmed the quality of life in some major cities, spreading slums, degrading water and sewerage services, and contributing to pollution and crime. Rural to urban movement does not always end in a nation's major cities. Nor is it always confined within the borders of countries in distress. Increasingly, people are leaving their homeland in search of jobs. Many enter neighboring countries; for example, from Haiti to Dominican Republic, Colombia to Venezuela, El Salvador to Honduras or from Saint Lucia to Barbados. More often they seek to move to the U.S. Between 1971 and 1985, over 2.5 million legally immigrated from the countries of the Caribbean Basin to the U.S., while untold additional thousands entered illegally and still more came as refugees. Given both the projected size of the region's future population, and the prospect that the group most likely to migrate (ages 15-35) may double in size over the next 30 years, pressures will mount for movement northward. In sum, the Caribbean Basin's near-term population growth is fairly well fixed and cannot be altered. Countries' population momentum and present age structure will intensify socio-economic and political problems for years to come. The region's demographic dilemma now has a severely complicating additional dimension. Since the mid-1970s many of the countries of the region have undergone their most severe economic decline since the Great Depression. With economic hard times has come added political stress, erupting in some states in political extremism, violence and drug trafficking. Even if their economies were strong and their societies stable, Caribbean Basin nations would still face daunting problems in adjusting to rapid population growth. But theirs is a double challenge. Demographic facts confront them with a steady rising demand for jobs, school, and public services at a time when their ability to provide them has faltered under harsh world economic conditions. Demographic trends pose many dangers for these countries. The critical question for their political stability, economic performance, and internal migration pressures is what they do with so many people. How can they employ or deploy the restless, mobile, and increasingly demanding millions of youth whose numbers will continue to skyrocket in the next two decades? The rapid growth of the labor force in the last three decades of the 20th century has critical implications for Mexico's social order. The demographic and social consequences of that growth will be no less critical for the U.S. in the years to come. 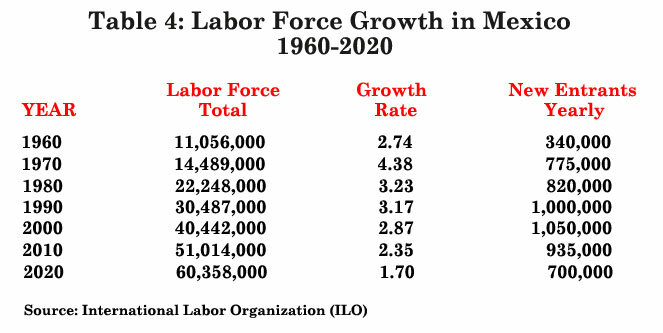 Mexico's labor force in 1985, according to the International Labor Organization (ILO), was 26 million. Between 1970 and 1985, it increased by 54 percent, an average annual increase of 3.7 percent. Growth peaked in the 1970s when yearly growth reached 4.4 percent. Some of the decade's increase reflected the rising participation of Mexican women. ILO projects Mexico's labor force to continue expanding by 3.2 percent yearly throughout the 1980s and 2.9 per the 1990s. This surging growth is more remarkable when contrasted with trends in the U.S. in the same period. The U.S. labor force grew from 82.7 million in 1970 to 117.1 million in 1985, an average annual 2.3 percent growth rate. High historically for the U.S., this rate was still less than two-thirds of Mexico's average growth rate during the same period. The gap between U.S. and Mexican growth rates will widen considerably in the late 1980s and early 1990s. The U.S. will add only 14 million workers to its labor force between 1985 and 1995, a yearly increase of 1.3 percent.5 Mexico's labor force will grow at 2 1/2 that rate, adding nearly 10 million candidates for jobs by 1995, though its population is only one-third and its economy one-twentieth the size of those of the U.S. The fifteen million young Mexicans reaching working age by 2000 are prospective claimants on Mexican society for jobs that are reasonably stable and satisfy basic needs. If their claims are unmet, they may follow several possible routes: apathy and withdrawal, joining millions of other underemployed Mexicans already in the country's shadowy subsistence economy; crime, vice or political extremism in pursuit of revolutionary change; and seasonal or permanent migration to the U.S. Although Mexicans have migrated northward in appreciable numbers since the1880s, Mexican legal and illegal immigration began to climb sharply in the mid-1960s, as indicated by immigrant visa applications and issuance, INS apprehensions, deportations, and the estimated overstays of visaed visitors. In 1965, the year the U.S.-Mexican Migrant Labor Agreement (Bracero Agreement) concluded, the INS made only 110,000 apprehensions. Within ten years this number had increased seven-fold to more than three-quarters of a million. By 1977 apprehensions exceeded one million for the first time. Arrests of illegal border crossers, 97 percent of them Mexican, reached 1.3 million in 1985 and could surpass 1.8 million in 1986. Many explanations have been offered for the sharp climb: 1) the end of the Bracero Agreement in 1965, which simply drove much of what had been legal labor migration underground; 2) the after-effects of the 22-year Bracero Agreement, which created networks and migration channels that gave illegal immigration a momentum of its own; 3) the explosive growth of the Mexican labor force stemming from the post-war surge in population, with rising education levels nurturing new expectations; 4) the demand for cheap flexible labor in the booming U.S. economy of the Vietnam era, when unemployment averaged below 5 percent between 1965 and 1974. Legal immigration from a particular country can be both an indicator of overall immigration demand and often a stimulant to illegal immigration, as families and friends seek to reunite, Legal Mexican immigration in the decade of the 1960s rose by 50 percent over the 1950s. In the decade of the 1970s legal immigration jumped again by another 41 percent, reaching an average of 64,000 a year. Legal immigration in the 1970s probably would have gone even higher, but in 1976 Congress placed an immigration ceiling of 20,000 on each western hemisphere country, but exempting close family members. Each year Mexico has filled its 20,000 ceiling and in addition sent about twice as many more close family member immigrants exempt from the ceiling. As 1986 began, 360,000 Mexicans were on the waiting list for U.S. immigrant visas. The American Embassy in Mexico estimated that 80 percent of the registrants were already living illegally in the U.S. The heavy migration from Mexico since the 1960s may well be only the leading edge of a far vaster wave of migrants that will seek to sojourn or to settle in the U.S. between now and the end of the century. Many of the demographic, social and economic factors driving this wave are already at work. Major lures are the presence in the U.S. of large welcoming Hispanic communities, village and ethnic networks to provide jobs and support to immigrants, and important U.S. industries that have accepted dependence on Mexican workers. The pulling power of these networks is suggested by INS figures showing apprehensions, when adjusted for the diversion of manpower to Florida during the Mariel boatlift in 1980-81, leveled off but did not appreciably decline during the 1979-1982 period of peak job creation performance of the Mexican economy, a period which also witnessed a sharp rise in U.S. unemployment (1980-1983) and, until 1982, an exchange rate favorable to the peso. To some degree, Mexican migration has acquired a dynamic of its own. Yet long-term migration pressures will depend greatly on the health of the Mexican economy, as well as the quality of Mexico's political life and its success in improving the distribution of income. What are the prospects that Mexico can spur the creation of new jobs for at least 14 million new workers between now and the end of the century? Mexico's strategy of economic development for more than three decades has favored investment in costly state-owned industries, in highly protected and inefficient import-substitution industries or in large scale commercial agriculture for export, to the neglect of small farmers. Heavy investment in the capital intensive petroleum and electricity sectors, other state-owned heavy industry, and irrigated farming boosted growth figures, but produced relatively few jobs for the amount of capital invested. Proliferation of state-owned enterprises in the 1970s created some jobs, but with high costs and low productivity. Employment, particularly in services, showed significant growth between 1978-1981. But much of this growth came as temporary jobs and was nourished by foreign borrowing as Mexico's foreign debt ballooned. The drastic decline of the petroleum prices from a high of $32 a barrel in 1981 to $14 a barrel in mid-1986, the heavy burden of servicing a foreign debt of $100 billion, and debilitating capital flight have made it impossible for Mexico to continue high levels of investment and subsidies to the public sector. Mexican economic policymakers now face the most serious challenge to the country since the revolution. The economic development policies of the last three decades are no longer sustainable in an era of austerity. For the foreseeable future debt payments will continue to siphon off nearly two-thirds of export earnings. The country must develop new export products and expand existing exports to replace the $9-10 billion earnings lost annually from the collapse of petroleum prices. Recovery of oil prices to their 1981 peak is an uncertain prospect. But even with optimistic assumptions about future oil earnings, Mexico's large debt burden and its poor prospects for quickly spurring non-oil exports will rule out resumption of massive public investment and subsidies. A major potential alternative source of capital and technology for growth, foreign investment, remains suspect in the nationalistic outlook of many Mexican leaders. Mexico's elites have ignored or neglected less glamorous sectors of the economy that elsewhere are major sources of new jobs. Tourism has not received a priority consistent with its job-creation potential. Small business entrepreneurs labor under the handicaps of scarce credit, direct competition from the state-owned sector, over regulation, and official corruption. Small scale, rain-fed agriculture has suffered the greatest neglect of all, though it now employs, or more often under-employs, 28 percent of Mexico's labor force. Mexico's small communal farmers, or ejidatarios, have generally received insufficient credit and technical and marketing assistance, and have seen their products often under-priced by the government's low Support prices and reliance on subsidized food imports. Additional woes in the 1960s and 1970s were chronic drought and the declining availability and quality of new arable lands. All these factors have added up to heavy underemployment on Mexico's small farms, low productivity, and drift to the cities. At least rhetorically, President Miguel de la Madrid, elected in 1982, recognizes that the economy must be restructured. The national development plan for 1983-1988 stresses job creation. The plan accepts that the protectionist industrial policies of the past have contributed to high levels of underemployment. The government intends to push for more efficient industries and for more growth in those areas that are competitive internationally.7 Some barriers to foreign investment have been lowered. Some analysts foresee a period of significantly lower growth in industrial employment in Mexico because of the need to eliminate non-competitive subsidized firms and reduce padded payrolls. The government's paring down of state firms since 1982 has already taken a heavy toll in unemployment. As industry recovers, keeping Mexican products competitive will require further devaluations of the peso. A central question here for Mexico's own political and economic stability, as well as for future immigration flows, is whether additional labor-intensive jobs, even if adequate in numbers, will offer the remuneration, security, and satisfaction necessary to hold young Mexican workers who might perceive far more attractive work above the Rio Grande. With the difference in potential real earnings between the U.S. and Mexican economies likely to grow, the "holding power" of new jobs in Mexico becomes a critical migration factor. Boosting productivity and employment in Mexican agriculture is even more problematic for Mexico's leaders, whose most urgent concern is to get more home-grown food and potential exports from the farm sector. Under present circumstances, agriculture will provide few of the extra jobs needed. However, an increasing percentage of the 4.5 million workers expected to remain in agriculture in 1990 will be wage workers, a trend that may help to narrow Mexico's rural-urban income inequalities and slow, but not stop, the exodus from the countryside. Before the 1982 collapse of oil prices and the debt crisis, the Mexican government was counting on the services sector to create two-thirds of all the new jobs in the 1980s. The optimistic estimates foresaw creation of new services jobs starting at the rate of 400,000 a year early in the decade, rising to one million a year by the end of the decade. But one-third to one-half of these newly created jobs would have come from expansion of government employment, with 6 million Mexicans directly or indirectly employed by the government by 1990.8 In fact, government employment has actually fallen, a victim of the country's shrinking revenues. Mexican unemployment estimates, based on surveys of major cities, are at best sketchy. Data for such sectors as agriculture and services are often rudimentary or unavailable. The figures understate the extent of underemployment. Many Mexicans, when lacking regular paid employment, either make do through self-employment, part-time or irregular work, return to farm work or to some other form of family employment, thus joining the ranks of the underemployed, or they withdraw from the labor force entirely. Mexican officials define an underemployed worker as one who does not earn annually at least the minimum wage, currently the equivalent of about $1,000 a year. Predictions of Mexico's future job creation rate are risky, as they depend on such unknowns as future growth rates, the mix of labor and capital in investment decisions, investment priorities and labor force participation rates. Since Mexico's present economic crisis began in 1982, its GNP has shrunk by 39 percent in dollar terms, with virtually no net increase in employment. Unemployment has grown from about 1.7 million in 1982 to the 5.1 million estimated for the end of 1986. Projection of the negative employment growth trend of the past five years to the year 2000 would foretell economic and social chaos, with 27 million Mexicans unemployed or underemployed in a labor force of 40.5 million. Such an extreme outcome can be avoided if Mexico, as expected, resumes modest economic growth as current economic reforms take effect. Yet, the structural changes contemplated in these market-oriented reforms may well further increase unemployment in the short and medium-term. But even under more optimistic growth projections, Mexico will be unlikely to create the more than 900 thousand jobs it needs annually. Applying the optimistic job creation multiplier of .6 for each percentage point of growth and with equal optimism applying the multiplier to current employment in the traditional as well as modern sectors of the economy, a healthy and sustained annual growth of output of 5 percent would yield yearly employment growth of three percent, 700-800,000 new jobs a year in the late 1980s. Impressive by any standard, this rate of job creation would still barely match the projected rapid growth of the labor force. Under this optimistic projection Mexico would still reach the year 2000 with 7.7 million unemployed, 19 percent of its labor force, and an additional 9 million still underemployed. A more discouraging picture emerges if projections up to 2000 are based on the highly respectable job creation experience of the U.S. economy since World War II. From 1948 to 1983 the U.S. economy added jobs at an average rate of 2 percent a year, among the best performances of industrial economies. Only in five of those years did job growth exceed 3 percent. A 2 percent average job growth rate for Mexico over the next thirteen years, a rate that would gladden most industrialized countries, would leave Mexico in the year 2000 with 19 million members of its labor force unemployed, underemployed or, seeking a life outside the country. Joining this prospective pool of 19 million job seekers as candidates for migration would be their current and future spouses and children, some of whom could be enticed at some point to join them by the prospect of superior U.S. education and social services. Worth repeating is that these discouraging job creation projections are based on growth assumptions that are optimistic in the light of Mexico's current economic performance. Data Resources Incorporated, for example, sees Mexico's annual economic growth averaging below 4 percent for the remainder of this decade, with industrial employment, where the greatest job gains are hoped for, expanding by only 2.3 percent annually by 1990.13 Merely to maintain unemployment and underemployment at present levels, Mexico must add new jobs at over 4.0 percent a year. If Mexico were to both hold unemployment at current levels and substantially eliminate under-employment by 2000, the country would have to create 1.3 million new jobs a year, a 6 percent annual increase. The U.S. economy in 1985, growing by about 3 percent, added 2 million new jobs, a job creation performance only slightly below the average for the past quarter century. But the U.S. economy is more than 20 times larger than Mexico's. In the absence of major and unforeseen social and economic changes, all conditions in Mexico point to heavy incentives for migration northward: a dizzying growth in the younger population (ages 15-34) most prone to migration; the availability of jobs to only half to at best three-quarters of those entering the labor force, and the declining economic appeal of the available jobs compared to alternatives in the U.S. as the value of the peso declines. The course of Mexico's politics may affect immigration as much as economic trends will. The political outcome over the next decade and a half will both shape and be shaped by the performance of the Mexican economy. Widespread, unyielding joblessness is politically corrosive. Political events could become the critical variable in the decisions of millions of Mexicans whether to try migration. The single party system, the Revolutionary Institutional Party (PRI), is hard pressed by the political stresses of five years of austerity and the growing resentment of much of the middle class. Charting Mexico's political future is no easier than foreseeing the course of its economy. Recent history and current events suggest four possible directions for Mexican politics to the year 2000, with varying potential to shape migration trends. Continuation of the present highly centralized, corporate authoritarian model represented by the PRI system, with slow and uneven evolution toward greater participation and more latitude for legal opposition groups. Such a trend would be unlikely either to ease such push factors as Mexico's serious maldistribution of income, corruption, and desultory human rights abuses, or to overcome the prevailing sense of apathy and cynicism among large numbers of Mexicans about the regime. Discouraging prospects for greater political participation could deepen alienation and pessimism among younger Mexicans. It is unlikely that the cautious and dogma-bound current system would encourage the economic innovations helpful to strong growth. Planned reforms of the economy may delay political reform because the system can't handle both at the same time. On balance, the political outcome of "more of the same" would be likely to reinforce other existing incentives to migrate, such as lagging economic performance and rapid growth of the labor force. This outcome, more unlikely than the previous one, would involve a rapid opening of the Mexican political system to greater Participation, including movement toward a genuine multi party system with authentic competition for power, and with greater respect for human rights and political dissent, and greater responsiveness to rank-and-file demands. The System's transition toward more pluralism and political competition would be unsettling, in the short run, heightening insecurity among some sectors that could harm the business climate and encourage out-migration. But over the longer term democratization could stimulate progress toward a more open economy, curbing corruption and over centralization. Job creation could improve. Many Mexicans might be encouraged to view their country's future with greater optimism and choose to remain part of it. Serious political unrest could lead to a more authoritarian, repressive regime of the right or, more unlikely, of the left as a way of dealing with economic decay and unmanageable public demands. A rightist regime could have somewhat better prospects of spurring rapid economic growth by gaining foreign investment, quashing ideological obstacles, and enforcing labor peace. But a right-wing authoritarian government would probably give lower priority to remedying the country's maldistribution of income or human rights abuses. The less likely alternative, a repressive regime of the extreme left, on the other hand, would risk the loss of major sources of foreign investment and financing and traditional markets for Mexican products. A state socialist model of development over the longer term could reduce income inequalities, but would risk deep disaffection among Mexico's middle and upper classes, as in Castro's Cuba. In either case, a likely environment of instability and insecurity, and tensions in relations with the U.S., would encourage emigration. A radical reorientation of the Mexican economy, or attempts at abrupt changes in the distribution of income, could profoundly chill economic growth and investment, and the economic expectations of millions of wage earning Mexicans, spurring out-migration. A hostile regime in Mexico City, or even a weak and troubled one, might well be less cooperative in curbing pressures for non-Mexican illegal migration across the common border. A clear worst case with an even lower probability would be the collapse of political stability in Mexico, with widespread insurgency violence and government counter-violence. Disorders might take many forms: rural insurgencies; rising urban rioting, terrorism and politically motivated crime, or internecine conflict within the armed forces and allied civilian factions. The economy would suffer accordingly. This "doomsday" outcome could be expected to spark huge outflows of Mexicans seeking either physical safety or economic survival in the U.S., particularly from the most strife-ridden areas. While the number of Mexicans who would seek refuge in the U.S. can only be guessed, it is worth recalling that the 1910 Mexican revolution spurred at least 500,000 Mexicans out of a total population of 15 million to move to the U.S. Then Mexico's population was concentrated in areas distant from the U.S. border. Now some six million Mexicans live within ten miles of it. Whatever the outcome of the internal conflicts in Nicaragua and El Salvador and of Guatemala's and Honduras' experiments with democracy, the current high level of Central American demand for immigration to the U.S. is likely to mount for the rest of this century. Well before insurgencies exploded in the late 1970s or early 1980s in El Salvador, Guatemala and Nicaragua, illegal migration to the U.S. had become a common practice. Indicators such as legal immigration, immigrant visa applications, exclusions, non-immigrant visa overstays, deportations, and apprehensions showed overall migration from the area shooting upward in the second half of the decade of the 1970s. The State Department in 1985 estimated illegal immigration from El Salvador and Guatemala in 1977 as 25,000 and 15,000 a year respectively.14 State Department officials estimate that some 350,000 Salvadorans were already in the U.S. illegally before civil strife erupted in 1980. Central America is now a prisoner of its own demography and history. Even if the area were at peace, politically stable, free of its twin burdens of heavy foreign debts and military outlays, its governments would still be hard pressed to cope with the rapid growth of the labor force. The economically active population of the five nations of Central America (excluding Panama and Belize) has increased by 55 percent in just 15 years, from 4.7 million in 1970 to 7.3 million in 1985; it will reach twelve million by the turn of the century. Costa Rica, El Salvador, Guatemala, Honduras and Nicaragua face the staggering task of creating productive employment for their estimated 2.8 million citizens already unemployed or underemployed and for the more than 300,000 new job seekers who will reach working age each year between now and the year 2000. Much of the recent debate over "sanctuary" or extended voluntary departure has assumed a direct cause and effect relation between civil violence and emigration. A longer range view, however, would see civil violence and emigration as themselves both consequences of unforgiving demographic trends. War and economic stagnation make the prospects for rapid job creation unusually bleak. Central America's economies, never robust, are only now emerging from a five-year decline marked by an average 24 percent drop in per capita output since 1981. In the healthy world economic conditions before the oil crisis peaked in the late 1970s, Central America's economic growth was adequate but not spectacular, ranging between 4.5 and 6 percent. The problems of high interest rates, high oil prices and low earnings on major export crops that triggered the slump have only recently abated. Negative growth rates in several countries are expected to yield to modest growth in the range of 2 to 3 percent in the late 1980s. But with Central America's annual population increase still approaching 3 percent, these modest growth rates will not arrest the region's drop in per capita income. The prospect for continuing decline of living standards has serious implications both for the region's political stability and for migration trends. A number of factors raise the odds against an early return to the economic growth of. the late 1960s. A medley of disruptions, continued military conflict, costly arms burdens, corruption, and government mismanagement which has discouraged private investment, will persist. Declining living standards may nurture a deadly cycle of internal insurgencies and personal insecurity which then become additional obstacles to recovery. Devaluations, tax hikes, budget cuts and inflation have impoverished much of the middle-class, making them potential migrants. A Central Intelligence Agency report of January 1986 even with optimistic growth projections of 5 percent per year, Central America's per capita income will not climb back to 1979 levels until 1997. Even then, current rates of unemployment and underemployment, which the report estimated at up to 50 percent, will not be reduced.16 The Kissinger Commission concluded that not until growth reached 6 percent a year would Central America absorb all new entrants into the labor force and begin to reduce unemployment. But even that projection seems optimistic, since the report itself notes that the area's respectable growth in the 1960s and 1970s left 4 to 5 million unemployed/underemployed. While El Salvador's land pressures are most intense, its neighbors, Guatemala, Nicaragua and Honduras, are rapidly exhausting their remaining agricultural frontier. All four are undergoing rapid population and labor force growth, and heavy migration to the cities. And by now all have well-carved channels of legal and illegal migration to the U.S. Education levels have risen rapidly enough to stimulate more expectations for social and economic change than can soon be met, but not far or fast enough to ease the shortages of skills that are bottlenecks to the region's development. El Salvador, is the region's most advanced case of demographic distress. With more than 5 million people crowded into an area the size of Massachusetts, its population density of 629 persons to the square mile exceeds India's. The distribution of land and other forms of wealth is markedly uneven, despite agrarian reforms since 1980. Available land is already heavily committed with no new areas remaining for settlement. Food cropland per person has fallen by two-thirds since 1950. The transition in the last three decades to large scale commercial farming in cotton, coffee, and cattle has either transformed many self-employed peasants into low-wage laborers or forced them into the cities or into the migration stream. The three-phase land reform since 1980 has eased somewhat the concentration of ownership, but even if fully successful will provide secure access to land to less than half the country's rural poor. With its population growing by more than 3 percent annually, Guatemala will reach 13 million by the year 2000. While two-thirds larger than El Salvador, Guatemala still sends fewer migrants, in part because of the country's somewhat better economic performance and milder land pressures, and because of a large Indian population tied by tradition to its ancestral homelands. But there are indications that growing competition for land, military harassment, stagnation of the agricultural economy, and the media-promoted attractiveness of urban lifestyles are making the Guatemalan Indian a candidate for migration. Nicaragua and Honduras have the region's highest population growth rate (3.4 percent annually) and most rapid rate of labor force growth (over 3.5 percent per year). Nicaragua must create 52,000 new jobs a year to keep unemployment from growing. But an additional 28,000 jobs would have to be created or upgraded each year to eliminate existing underemployment and unemployment by the year 2000. Yet Nicaragua's deeply troubled economy is creating virtually no new civilian jobs. Civil strife and a slumping economy since the late 1970s have reinforced migration momentum. By some estimates nearly 225,000 Nicaraguans now live illegally in neighboring Central American states and as many as 100,000 reside in the U.S. Assuming the continuation of the Contra insurgency, Sandinista efforts to transform the economy along socialist lines, and general mismanagement, Nicaragua's return to the more robust growth levels of the 1960s and 1970s seems remote. Any move by the Sandinistas to deal with unemployment by mass labor mobilization schemes or other forced draft measures is likely to spark even greater migration pressures. Honduras exhibits the most rapid rate of rural to urban migration in Central America, with a relatively slow-growing industrial base to absorb the migrants. 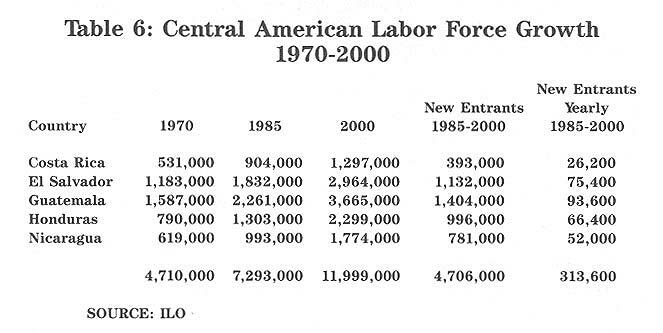 Even with return of the peak growth rates of the 1960s and early 1970s of 4 to 5 percent a year, the Honduran economy may absorb only one-half to one-third of the 65 thousand new entrants yearly into the labor force. Clearly economics, politics and demography point to heavy growth of Central America's pool of prospective emigrants over the next decade-and-a-half. The five Central American countries, with a combined economy the size of West Virginia's, must create 310 thousand jobs a year just to keep current high unemployment and underemployment levels from rising. Migration over two decades has developed a brisk momentum that will yield only slowly to internal improvements. The most favorable political and economic outcomes, growth rates of five percent with the emergence of stable, humane and responsive governments, would still leave as much as half the five million young Central Americans entering the labor force in that period serious candidates for migration. But current trends in the region do not presage healthier economic and political conditions soon. Continuation of insurgency, oppression, and the accompanying economic decay for the remainder of this decade will keep the region's ominous migration pressures high. Further escalation of the guerrilla war in Nicaragua, or its spread into neighboring Honduras, Costa Rica and El Salvador, could sharply expand the numbers seeking to leave. The 22 Caribbean island states are easily the greatest producers of immigrants to the U.S. relative to their population size. In 1985 those states sent a total of 83,000 legal immigrants or 14.5 percent of the total, though their combined population of 29 million, was only one-half of one percent of the world's total. Annual legal migration to the U.S. of some of the region's smaller English-speaking states regularly approaches or exceeds 1 percent of the total population. Guyana, with a population of only 800,000, legally sends between 8 and 10 thousand persons to the U.S. annually. Since independence, St. Kitts-Nevis has regularly sent at least 2.5 percent of its total population of 40,000 as immigrants. In 1983 an incredible 6 percent of its population migrated to the U.S. More than 60,000 Jamaicans were on the waiting list for U.S. visas in early 1986, nearly 3 percent of its population. This high propensity to migrate has diverse causes. Like other Third World nations, the islands have since the late 1970s been in a serious economic slump brought on by either high interest rates and/or, for some, oil prices, and falling prices for their products. Prices for Jamaican and Guyanan bauxite, Dominican and Haitian sugar and coffee and, later, Trinidadian petroleum, have suffered sharp declines in the past ten years. But economic downturn is not a complete explanation. Prosperous by Third World standards, Barbados, Bahamas, and Trinidad and Tobago also have consistently maintained high rates of out-migration in good times and bad. For most of the English-speaking island states, where education levels are high by Latin American standards, immigration to the U.S. to study and to work, has become a way of life. The U.S. has become the "metropole" for these societies, with an inexorable cultural pull on the ambitious Caribbean migrant. Sociologist Anthony Maingot sees the U.S. and the English-speaking Caribbean as having become a single socio-cultural area in which migration is motivated by many factors other than work opportunities. Britain's restrictions on Commonwealth immigration beginning in 1962 diverted further migration to the U.S. The English-speaking islands now orbit wholly in the migration gravity field of the U.S., held ever more securely by bonds of a common language, extensive family and ethnic links, and an American cultural presence in their lands reinforced in recent years by tourism and the miracle of satellite TV. Though poles apart ideologically, Cuba and the Dominican Republic remain major migration clients of the U. S. Legal migration of Cubans to the U. S. was substantial and growing in the period between Cuba's independence in 1902 and the emergence of the anti-American Castro regime in 1959. The Cuban cultural and, more recently, economic, presence in the U.S. and sizeable ethnic communities in South Florida, New York and New Jersey continue to exercise a powerful pull, aided by the self-nourishing process of family reunification. While legal Cuban immigration has ranged only between 8,000 and 10,000 yearly in recent years, these levels would skyrocket if normal U.S. immigration procedures are reestablished in Havana. But Cuba's longer range migration outlook lacks the momentum of Mexico and Central America, as population growth rates have fallen to the second-lowest level in Latin America. The Dominican Republic, with only 6 million population, has become the Caribbean Basin's second largest source of immigrants after Mexico. Economic push factors since the early 70's have reinforced a strong historic migratory trend. The upward trend in Dominican migration appears little affected by the existence of stable, democratic government since the late 60's and impressive economic growth until 1975. Annual Dominican legal migration has been about 22 thousand a yea since 1983, illegal Dominican migration may at least match that amount. According to 1977 estimates by the Department of State, there were 35,000 Dominican illegal migrants annually. Many illegal Dominican migrants pass through Puerto Rico, as many as 18,000 a year in "Yolas," small boats that smuggle migrants across the Mona Passage. Overpopulated, eroded, deforested and misruled, Haiti has the hemisphere's worst quality of life and most intense migration pressures. Its $360 individual GNP ranks it with Pakistan and India. The desperate flight of Haiti's "boat people" to South Florida and the Bahamas, and profuse Haitian migration for menial work in the Dominican Republic, testify to the economic and demographic disaster area the country has become. The production of small-scale farms, the heart of Haiti's economy, has been stagnant for 20 years, plagued by inefficient land division, deforestation, soil erosion and government neglect. Sixty-five percent of the labor force is unemployed or underemployed with 70,000 new workers added annually. The overthrow of the despotic Duvalier regime in February 1986 appears to have made little difference in migration. Coast Guard interceptions of Haitian migrant vessels have increased rather than declined in the months following Duvalier's removal. Declining population growth in some island states over the long term may slow the current heavy migration. Cuba, Jamaica, Trinidad and Barbados have reduced their natural increase a rate below 2 percent. But overall immigration demand from the area will remain high for the rest of the century because of the magnetism of U.S. society. Three major source countries, Dominican Republic, Haiti and Jamaica have large percentages of those populations in the age groups with the highest propensity to migrate. With a population of only 300,000, The Bahamas' location has made it a a critical conduit in the heavy flow of Caribbean and non-hemispheric illegal migrants into south Florida. Often with the aid of professional smugglers, Cuban and Colombian illegals have used the Bahamian bridge. Much of the Bahamas 70,000 member Haitian community, periodically threatened with expulsion, aims ultimately at clandestine migration to the U.S. Thousands of other Haitian boat people have used it as a way-station. A more troubling trend of recent years is the use of the Bahamian connection by international alien smuggling rings to smuggle growing numbers of migrants from India, Pakistan, Bangladesh and Sri Lanka into South Florida. The Republic of Colombia, whose population of 30 million is as large as all independent Caribbean island states combined, has emerged as a major immigration source country since the 1970s. Legal immigration from Colombia from 1970 to 1977 averaged only 6,500 yearly. Since 1978 it has been averaging over 10,000. Deportations of Colombians are now exceeded in the hemisphere only by Mexicans, Salvadorans and Guatemalans. Growing Colombian communities in South Florida, New York, New Jersey and elsewhere are both a lure and a potential support system for additional migrants and provide the family connections. Economic slump in Venezuela, now host to as many as 4 million Colombians, and tighter Venezuelan immigration restrictions, have deflected more Colombian migrants to the U.S.
Colombia's economic growth has lagged behind population growth since the late 1970s and real incomes have fallen in the recession of the 1980s. Colombia's population is projected to grow to 39 million by 2000, with its labor force increasing from its present 8.7 million to 13 million. The government placed unemployment at 13.4 percent in 1984, but underemployment was estimated at twice that level or more. Colombia must create nearly 250 thousand jobs each year to hold the line, a target the economy shows no sign of meeting. A series of devaluations since 1981 makes the option of working in the U.S. more attractive. Sporadic violence and lawlessness that have impaired Colombia's quality of life since the late 1940s show no signs of disappearing from national life. Illegal migration from Colombia's Andean neighbors, Ecuador and Peru, is also rising. Momentous problems lie ahead lithe economies of the Caribbean continue falling behind the rapid growth of their population and labor force, momentous for those nations and for the U.S. The interests at stake for the U.S. are formidable and diverse, ranging from basic humanitarian concern to the security of its sea lanes, from control of its borders to the preservation of its trade and investment. Proposed remedies abound, economic, political and demographic, but all are beset with built-in difficulties and little promise of rapid results. Not only is more investment needed, but investment more carefully targeted to labor-intensive production. In its 1985 report the Inter-American Development Bank, warning of discouraging unemployment trends, urged new development strategies for Latin America that would encourage the use of efficient labor-intensive techniques in medium-size enterprises and raise the employment content of many economic activities. While not a guarantee of economic growth, political reforms could ease migration pressures. Replacement of repressive and authoritarian governments by more democratic leadership could set the stage for a more equitable redistribution of income. Curbing the region's widespread corruption would release entrepreneurial energies and make public investment more efficient. The alternative to democratization, extremist revolution or political despair, would give millions more incentive to migrate. Demographic change could help alleviate of the pressures in many of the countries in the region. Rapid reduction of fertility would drastically lower growth rates but leave the immediate economic problem untouched, since those entering the labor force for the next fifteen to twenty years are already born. Even so, those countries where fertility is still high, particularly in Middle America, would gain in two ways from stepped-up family planning programs: The employment problems of the early 21st century would ease somewhat; and fewer children would permit redirection of funds for schooling into job-producing investments. For some, another demographic "solution" is massive increases in emigration. In a recent statement to the Academy of Medical Demographic Research, Mexican Economist Victor Urquidi, estimated that at least 200,000 Mexicans of working age emigrate permanently every year, and if Mexico was to have even the slightest chance of easing its unemployment many more might have to emigrate. Urquidi's conservative estimate does not project the rapid future growth of the pool of emigrants, and disregards the hundreds of thousands of other Mexicans who now live and work temporarily in the U.S. More accurately expressing the full dimensions of Mexican emigration was Mexican Senator Heladio Ramirez, who testified to a committee of the California State Assembly in 1985 that 20 percent of Mexico's labor force is now involved in the migration flow to the U.S., some 5 million workers.21 Proportionally, migration demand in economically stagnant Central America may well exceed Mexico's. Must the U.S. keep open its border to solve the economic problems of its neighbors? Such an approach could drastically affect the society and economy of the U.S., while providing only limited relief to the sending countries. Already, the U.S. accepts almost 200,000 legal immigrants and possibly another 300,000 to 400,000 illegal permanent immigrants from the Caribbean Basin each year. What are the numbers that must be accepted in search of social tranquility south of the border, 1,000,000 per year? Coming at a time when non-western hemisphere immigration demand is also rising, this alternative is unrealistic and would meet sharp political resistance. Nevertheless, like it or not, this alternative must be seriously examined, as the U.S. may choose it by simple inaction. Humans have always been driven to migrate in search of a better life, and the process has long proven difficult for receiving states to control. However dismal the immigrant's lot may seem, it is often superior to what he experienced in his homeland. Thus, both "pull" and "push" factors will continue to lure migrants northward. The lack of jobs at home will "push" the immigrant out of the region; the opportunity to secure employment, however low the wages, in the factories, restaurants and farms of the U.S. will "pull" him north of the border. Desire for family reunification and the ready availability of publicly-funded schools, medical care and other social services will attract the prospective workers' dependents in increasing numbers. Few would disagree that the U.S. should adopt enlightened trade, aid and investment policies to encourage healthy growth and job creation. Prolonged discussions between the U.S. and have-not nations in the U.N. and Inter-American systems in the past two decades have yielded a number of proposals to ease the flow of investment and technology on favorable terms, to open western markets to developing countries' labor-intensive manufactures, and to encourage greater consumption at better prices of the Third World's raw materials and farm products. The U.S. has experimented with a number of these ideas: commodity agreements, trade preferences for Third World states such as the Generalized System of Preferences (GSP) or the Caribbean Basin initiative, and the transfer of labor-intensive U.S. manufacturing processes to so called "twin plants" in Mexico and the Caribbean. Handicapped by budget limitations, protectionism and ideological objections in the U.S., these arrangements have yielded mixed results. Repeated U.S. cuts in sugar imports since 1982 have cost Caribbean nations more jobs than the Caribbean Basin initiative has so far created. Of the more economically successful programs to stimulate labor-intensive production are the Mexican border "Maquiladora" plants that assemble components for export to the U.S., which now employ more than 200,000 Mexicans. Easier terms on Latin America's $380 billion debt, $100 billion of it held by Mexico, is a must for the region's political stability and economic health. Desperate for investment for jobs and growth, Latin American nations, according to the Inter-American Development Bank, are sending abroad more in loan payments and capital flight than they are receiving in new loans and investments. Enlightened trade, aid and investment policies deserve support if for no other reason than their contribution to stable international relations and a sounder world economic order over the longer term. But there should be no illusions that even the most enlightened economic policies will have significant effect on rising immigration pressures from the south in the short run. A greater risk is that special interests will hold up such enlightened policies as a false alternative to the prudent but difficult steps the U.S. must take in the short run to contain migration pressures. The U.S., which has rarely seriously enforced its immigration laws, has a number of options for reducing the lure of the pull factors and blocking illegal entry. They deserve a trial. In general, the U.S. must commit itself without delay to further tighten immigration enforcement at three lines of defense: 1) at the border and ports of entry, with a larger, properly equipped and funded border patrol; 2) at the work place, by implementing sanctions against employers of illegal aliens, and vigorously enforcing high labor standards; 3) and at the diverse and expensive safety net of social welfare benefits, by effective identification systems that ensure their use by citizens and legal residents only. Facing the prospect of years more of economic and social malaise in the region, U.S. policymakers must define and maintain rigorous criteria for distinguishing authentic refugees from economic migrants, for winnowing out those escaping the truly life-threatening from those leaving the merely uncomfortable. The U.S., as the world's premier host to immigrants, faces a dilemma as it tries to cope with the rising tide of prospective migrants. It is justly proud of its historical welcome to newcomers from other lands. Yet, as the 21st century approaches, it is becoming increasingly evident that the nation cannot possibly make a home for all the vast numbers who wish to enter, whether legally or illegally or as refugees from political oppression. The numbers are awesome and would erode opportunity in the U.S. for all, citizen and immigrant. Yet, short of economic miracles, immigration pressures in the Caribbean Basin will grow in future years. The rapidly increasing number of young adults is a demographic fact, but the jobs are not likely to be there for them. Their option is simple: move north and eventually reach the U.S., using any device to enter and remain. Demographic, economic, political and law enforcement approaches must be taken together if U.S. interests are to be safeguarded and the Caribbean Basin is to survive this population eruption without upheaval. The consequence of the rapid population growth so long perceived but so little acted upon are now a challenge the U.S. and Caribbean Basin nations must face. Leaders of all governments must recognize its urgency and adjust their priorities accordingly. But the U.S. must be prepared to take prudent unilateral steps in exercise of its sovereign right to protect its borders. 1 Thomas W. Merrick: Population Pressures in Latin America, Population Bulletin, Vol. 41, No.3 (Washington, 1986). 2 United Nations: World Population Estimates and Projections as Assessed in 1984 (New York, 1984). 3 United Nations: Patterns of Urban and Rural Population Growth (New York, 1980). 4 International Labor Office: Economically Active Population, 1950-2025, Volume III (Geneva, 1986). 5 U.S. Department of Labor: Employment Projections for 1995, Bulletin 2197, (Washington, March 1984). 6 Francisco Javier Alejo: "Demographic Patterns and Labor Market Trends in Mexico," Mexico's Economic Crisis: Challenges and Opportunities (La Jolla, Calif., Center for U.S.-Mexican Studies, 1983); and, U.S. Department of the Army: Mexico: A Country Study (Washington, 1985), p. XXXVll. 7 William Glade: "Likely Strategies and Effects of Economic Distribution Policies," Paper presented at U.S. Department of State conference on Mexican Trends: The Next Five Years, Washington, December, 1985. 8 Robert E. Looney, Development Alternatives of Mexico, Beyond the 1980's, (New York: Praeger, 1982), p. 33. 9 Victor Urquidi: "Population and Employment at the End of the Century" (Mexico, DF, March, 1986. Unpublished). 10 Carlos Acosta: "Vigor Mounts in Words; in the Deeds the Country Continues Falling," Proceso, June 9, 1986. 11 Alejo, op. cit. The job growth multiplier of. 6 to. 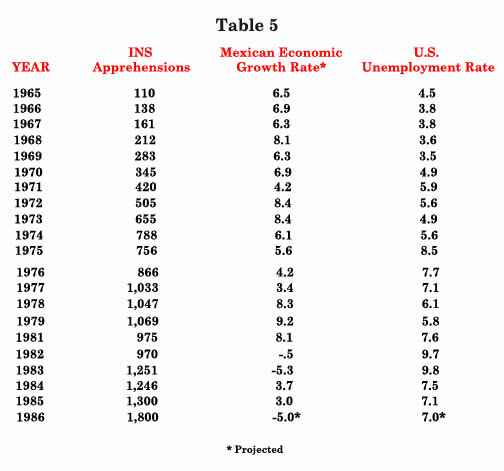 7 for each percentage point of growth posited by the author appears high for Mexico, the job growth ratio for the U.S. since 1960 averages .63, in view of the country's low absorption of labor in the 1960s and 1970s when growth rates were over 6 percent annually. Given the annual job creation of 300-400,000 during those two decades this rate would appear to apply only to job growth of Mexico's wage sector, which is covered by government surveys, and not to the subsistence agriculture and urban informal sectors that contained nearly 50 percent of the labor force. 12 Salvador Cono, "More than 4000 Persons a Day Out of Work as Businesses Close," Proceso, July 7, 1986. 13 Latin American Review, Winter, 1985. 14 Department of State: Atlas of the Caribbean Basin, Washington, 1984, p. 14. 15 Report of the National Bipartisan Commission on Central America, (The Kissinger Commission), Washington, 1984, p. 33. 16 Roger Fontaine: "CIA Pessimistic About Future of Central America Economy," Washington Times, January 31, 1986, p. 1. 18 Anthony P. Maingot: "Political Implications of Migration in a Socio-Cultural Area," Migration and Development in the Caribbean (Boulder, Colorado: Westview, 1985). 19 Tomas J. Espenshade: "The Cost of Job Creation in the Caribbean," (Washington, 1986. Unpublished). 20 Department of State: The U.S. and Central America: Implementing the National Bi-Partisan Commission Report, Special Report 148, (Washington, 1986), p. 4. 21 California State Assembly Committee on Inter-Governmental Relations: Hearings on California-Mexico Relations, November 15, 1985 (Sacramento, 1986). Leon Bouvier is a demographer and former Vice President of the Population Reference Bureau, Washington, D.C. He has written extensively on world and hemispheric population trends and their effects on immigration. David E. Simcox is a former career foreign service officer of the U.S. Department of State who held diplomatic assignments in Mexico, Central America and the Caribbean, and as Director of the State Department's Office of Mexican Affairs. This publication benefited from the review and helpful suggestions of Dr. George Grayson, Professor of Government, College of William & Mary.